A new CD with music recorded by composers from Europe and America has been released. The new album music of Sonorizzonte Munich ensemble includes work by Azerbaijani composer Firangiz Alizade, Trend Life reported. The work "Schwindende Schönheit" ("Vanishing Beauty") was premiered in Germany in 2015. The music piece tells the story of the vanishing beauty of architectural monuments that are disappearing before our eyes, leaving behind a bitter feeling of regret and irrecoverable loss. And now, after the successful tour of the Sonorizzonte ensemble in Europe, the CD and DVD discs of this program were recorded. Works of Paul Hindemith (Germany), Claude Debussy (France), Steve Reich (U.S.), Georg Kurtag (Switzerland) are also included in the new album. All these works are united by nostalgia for the past, memories of better times, the theme of farewell and separation. 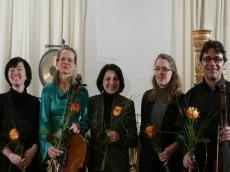 In addition, "Sonorizzonte" consists of unusual vintage instruments and famous musicians - Andreas Tisotti (Viola da gamba), Jessica Kun (Barokcello), Paradise Watanabe (Percussion), Miriam Schroeder (Harfe).